Honshu Island sits at the confluence of the Okhotsk Current which pushes cold water southward from Russia and the Tsushima Current which carries warm clear water northward from the Philippines. 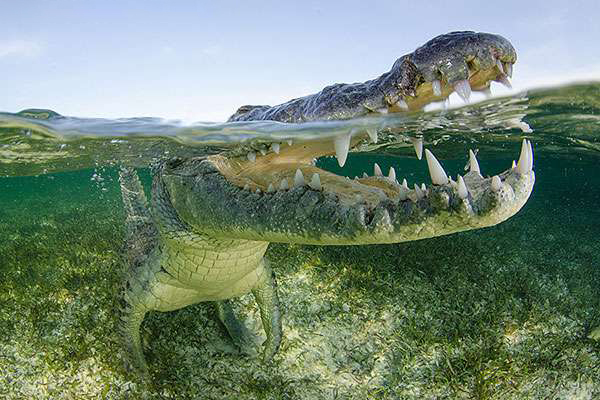 Where these currents collide, animals of all shapes and sizes can be found. In this extremely special spot, there are lush reefs of soft corals populated by countless sharks and rays. Scuba diving with Japanese sharks and rays. The most common shark species that you will see are banded houndsharks; a generally shy species that – over a period of years – have become used to human contact. 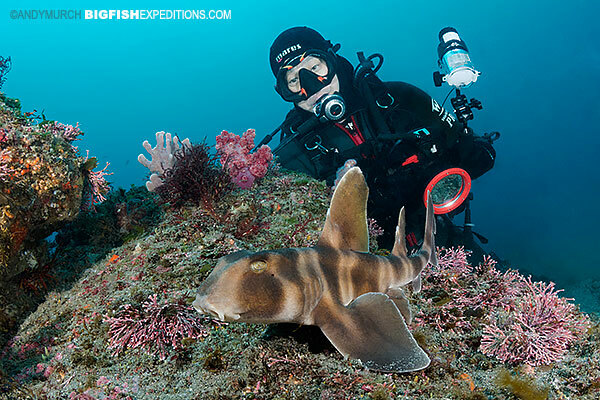 When we conduct the shark feed, you can expect to see literally hundreds of Banded houndsharks in one small area. This is a dive not to be missed! Another common shark on the reefs around Chiba is the Japanese horn shark. With a good guide and some observant hunting, his beautiful species can often be found hiding under ledges or sitting motionless in plain sight. This one is definitely not shy! Its super easy to close to this shark as sits patiently hoping to blend into its environment. More difficult to find than its horned cousin, the blotchy or Japanese swell shark is another slow moving species that likes to wedge itself under overhangs and inflate its belly with water so that it can’t be dislodged. This unusual little ray species lives on the sand in close proximity to reefs where it has a steady supply of prey species. Finding these pint sized predators can be a challenge because – with a flick of their pectoral fins – they can disappear under a fine layer of sand. Watch out where you are kneeling, this ray packed a serious electric punch even when under the sand. Dive under a blanket of sharks at Mikomoto Island! Once we leave Chiba and head along the Izu Peninsula, we will be in hammerhead country. Mikomoto is Japan’s version of Cocos Island where, on a good day, schooling scalloped hammerheads fill the heavens. While at Mikomoto we will also go on the hunt for the elusive Japanese wobbegong shark; a northern relative to the more common wobbegongs that are found around Australia. When diving around Honshu, always keep one eye on the blue and one eye on the sand. Although uncommon, you may stumble upon a Japanese angel shark! Perhaps even more abundant than the banded houndsharks, you will probably be bombarded by scores of red stingrays during the shark feeds in Chiba. Armed with sharp tail spines, these rays show up in droves hoping to sneak a scrap or two. Fortunately, they never use their barbs on divers unless you accidentally land on one! If endless sharks starts to get a little monotonous, its a quick kick into the lush soft coral reefs where a myriad exotic fish await! The diversity of species around Honshu Island is world class. From huge bristlechin fish to intricately patterned morays and rockfishes, there is enough life on these reefs to keep even the most jaded diver happy. Day 1 After an easy 11am pick up in Tokyo, you will travel in our private group bus to the hotel in southern Chiba prefecture (about 3hrs by road). Once we check in we will visit the dive shop and arrenge equipment before heading out for supper at a nearby restaurant. Day 2 After a light breakfast, we will head out to sea for three banded houndshark and/or reef dives. Day 3 Three more shark dives including time for exploring the reef in search of Japanese horn sharks and other species. Day 4 Three more sharky dives in Chiba. Then, we will pack up and relocate to the Izu Peninsula; about 5hrs by private bus. Dinner at a restaurant near Mikomoto Island in southern Izu. Day 5 After breakfast, we will head out for two dives at Mikomoto Island in search of schooling hammerheads. Day 6 On our last day of shark diving we will return to Mikomoto Island. As well as the hammerheads, we will spend some time looking for endemic Japanese wobbegong sharks. Then, back to the hotel to pack and relax before heading out to dinner. Day 7 After a quick bite we will drive back to Tokyo, arriving around noon. Time for fond farewells for those flying home or you can extend your adventure by joining us on to our optional Giant Salamander Expedition.